How Trading Can Be As Easy As 1-2-3! In reality anything that has a price that fluctuates can be traded off a chart – so that could be oil, gold, currencies, even pork bellies. Think about it now that Facebook has gone onto the stock exchange; you can even trade Facebook! So why do product prices fluctuate? The prices of products fluctuate due to a very simple concept. 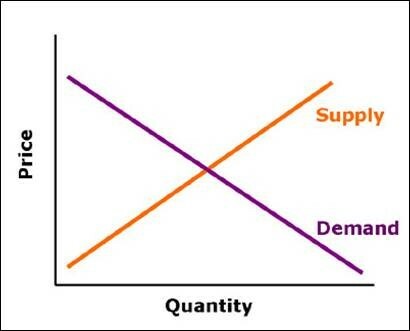 Supply and Demand. An increase in demand, generally means there are more buyers than sellers of a product – causing the price to increase. An increase in supply, generally means there are less buyers than sellers of a product – causing the price to decrease. So how can I use this to make money trading? The key thing here is to know when the balance of supply and demand is going to change i.e. when will supply increase or when will demand increase. The added benefit that trading has over property, business and other types of investment, is you that you can make money whether prices go up or down. As Traders all we are simply trying to work out one thing; whether we think the price will increase or decrease in the future. If you know which clues to look for, you will be highly successful at predicting which direction the price will go and can therefore make a lot of money. If you think a price is going to go up, you will place a trade that makes money if the price increases. This is called going LONG or buying. If you think a price is going to go down, you will place a trade that makes money if the price decreases. This is called going SHORT or selling. There are certain clues in the market that will always give us a heads up of when demand and supply are coming into play and the price is potentially going to go up or down. 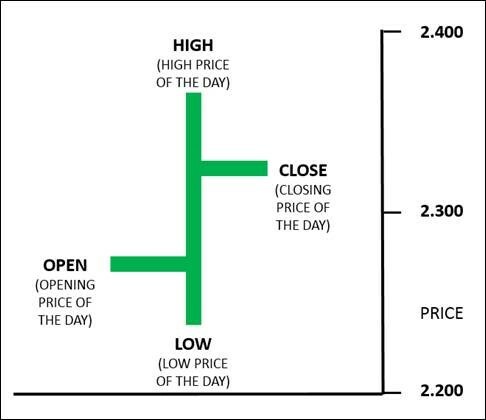 Here at Learn To Trade we use an OHLC bar on our trading charts – OHLC is short for Open, High, Low, Close bar. Basically, the price that day closed at a higher level than it opened and you can also see the highest price and lowest price for that day. Now there are other types of bars that will give a good indication when supply and demand are changing, these bars are called high- test and low-test bars. As you can see the high test bar has the open and close in the lower half of the bar, as price ‘tested’ the high and was pushed away from it. 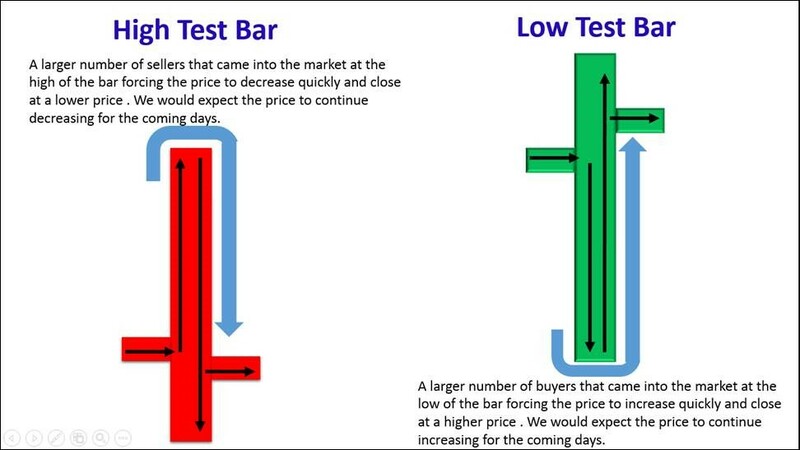 Whereas the low test bar has the high and close in the upper half of the bar, as price ‘tested’ the low and was pushed away from it. In both cases, in order for the price to swing around from the high or low so quickly it indicates that a large number of sellers or buyers have suddenly come into the market, which will usually drive the price up or down for a matter of days.